Two teenage girls have been indicted on hate crime charges over an attack on a trans woman in a Maryland McDonald’s restaurant last month. The attack on Chrissy Lee Polis, 22, was filmed by a store employee and posted online. 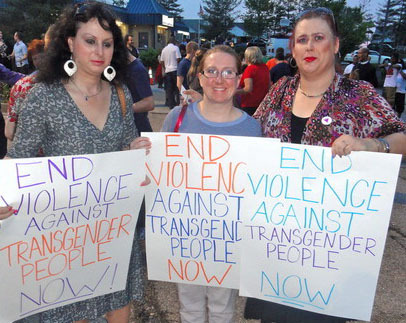 It made headlines around the world and renewed calls for more to be done about transphobic violence. Teonna Brown, 18, was indicted today by a grand jury on first and second-degree assault. Both offences were classified as hate crimes. A 15-year-old girl, who cannot be named due to her age, was indicted on the same charges and will be tried in a juvenile court. Ms Brown is being charged as an adult. In the footage of the attack, Ms Polis is seen being punched, kicked and dragged across the floor by two females. At the end of the footage, she is seen having convulsions. The McDonald’s employee who filmed the attack, Vernon Hackett, has now been fired. McDonald’s condemned the incident. Ms Brown’s attorney says she was defending herself from Ms Polis and is innocent. Lynne Bowman of LGBT group Equality Maryland said: “Today the State’s Attorney for Baltimore County came to the only possible conclusion in deciding to try the assault on Chrissy Lee Polis as a hate crime. Speaking to the Baltimore Sun last month, Ms Polis said she was now too scared to go out of the house. She claimed the attack started after the girls saw her in the women’s bathroom and said her injuries would have been worse if an older female customer had not helped stop the assault.